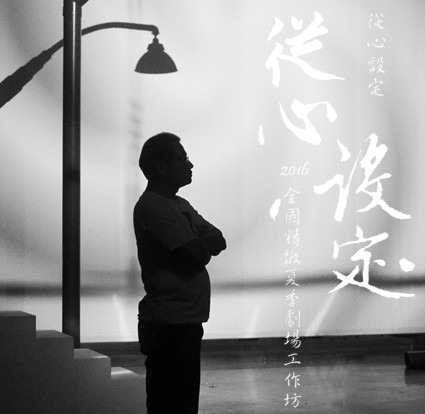 Since its new beginning, the collaboration between the Taipei Symphony Orchestra and Principal Conductor Gilbert Varga has been warmly received by countless fans. The presented repertoire of each concert program has included music spanning periods from the classical to the modern, as well as musical works from Europe to America. From these concert performances, music enthusiasts have been given the experience of a wide range of musical periods and styles. 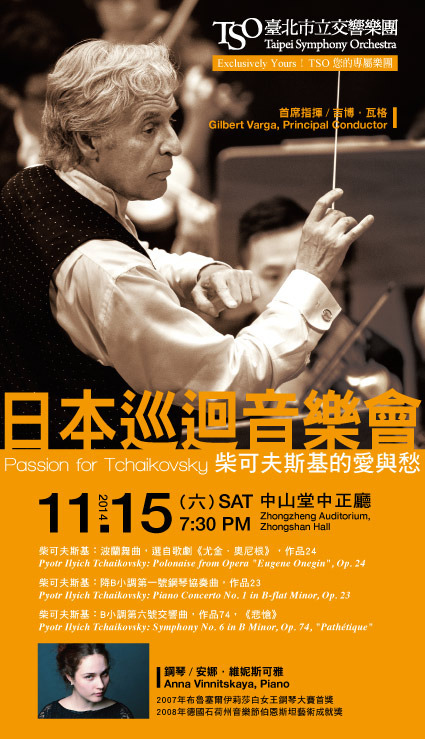 The second half of the 2014 concert season will also be led by Gilbert Varga himself, who with the Taipei Symphony Orchestra, will bring a fresh and unique approach to the music stage. Nine days after leading the debut performance of his last completed symphony － Symphony No. 6, Pathétique － Tchaikovsky died at home in St. Petersburg. Some musicologists, such as Milton Cross and David Ewen, believe that the composer was aware of his imminent death and wrote this last symphony as his own requiem. Tchaikovsky was a shy, introverted character. His emotional world has always remained a mystery; however, the abundance of emotion in his heart and an unspeakable melancholy are evident in his music. In 2007, Russian pianist Anna Vinnitskaya won first prize in the Queen Elisabeth Music Competition in Brussels. Under the direction of maestro Gilbert Varga, Vinnitskaya will be performing Tchaikovsky's most popular work with the TSO — Piano Concerto No. 1 in B-flat Minor. This impassioned work of unique resplendence carries a hint of sorrow and it is the most often played of the composer's three piano concertos. Precisely because it is played so often is one reason why the piece is perfect for exhibiting the true talent of any performer. Anna Vinnitskaya was born in 1983 in Novorossiysk, Russia. She has won several international piano competitions. Among her awards are the first prize at the Queen Elisabeth Competition in Brussels （2007） and the “Leonard Bernstein Award” of the Schleswig-Holstein Musik Festival（2008）. Since the beginning of the 2009/2010 season she is taking part in the concert series “Junge Wilde” at the Konzerthaus Dortmund for the duration of three years. This special series, presenting seven young artists who pursue ambitious careers, attracts great attention nationwide. Anna Vinnitskaya has been recording three CDs–all three published by the French label Naïve. The first CD featuring works by Rachmaninov, Gubaidulina, Medtner and Prokofiev was published in 2009. This recording was awarded the “Diapason d'Or Nouveauté” as well as the “Choc du Mois” by Classica Magazine. Furthermore, it was nominated for a Midem-Classical Award（category “Instrumental Solo”）. In October 2010, this highly successful CD was followed by another: Anna Vinnitskaya's first orchestral recording as the soloist of the Deutsches Sinfonieorchester Berlin under the baton of Gilbert Varga. Anna Vinnitskaya received the “ECHO Klassik” award in October 2011 for this recording. In February 2012 Anna Vinnitskaya's third CD, that is dedicated to piano works of Maurice Ravel, was published. It was awarded with the “Gramophone Magazine Editor's Choice” and the “Diapason d'Or” .